Here in the frigid depths of January, sometimes all you want to do is hibernate. Just pile the pets on the bed, throw the covers over your head, and snooze until spring. But people (and their pets) aren’t wired like bears and chipmunks: we can’t hibernate, even though the prospect sounds so appealingly cozy. We still have to go to work and the doggos still need to be walked. If it’s too cold for you, it’s too cold for them. While some breeds of dogs and cats are well-prepared for cold weather, most are not. Limit their time outdoors. Make sure short-haired breeds and smaller animals (who tend to lose body heat more quickly) have a warm coat on in addition to their natural protection. Booties! Is there anything funnier than a dog doing the Big Shoe Dance the first time she is introduced to winter footwear? But beyond being able to laugh at your pet’s wounded dignity, booties serve two vital purposes: they protect tender paw pads from icy sidewalks and they prevent animals from licking road salt and other harmful or even poisonous chemicals (like antifreeze and other de-icers) from their paws. No baths, please! Cats are remarkable self-cleaning little critters. Dogs… not so much. But unless your dog has been rolling in something stinky, try to hold off on the baths during winter. The oils that accumulate in their undercoat are great insulators, and stripping them off with soap leads to one shivering and miserable pupper. If you absolutely must wash your dog, make sure she’s thoroughly dry before letting her outside. Be aware that the last part to dry is the fur closest to the skin, and that’s the bit that most needs to be fully dry to offer the best protection from the elements. Wet fur on a cold day is no fun at all. Make sure your pet has a warm bed, and thoroughly towel them off with a clean dry towel when they come back inside. Nobody wants to curl up for a post-walk nap with wet hair! If your pets live outdoors, make sure they have a safe, warm, dry space to retreat to when the winter winds are howling. Consider using heat lamps in the barn or garage and put down warm bedding (or better yet, a raised and insulated platform) to keep your beasties snug and warm when it’s icy out. 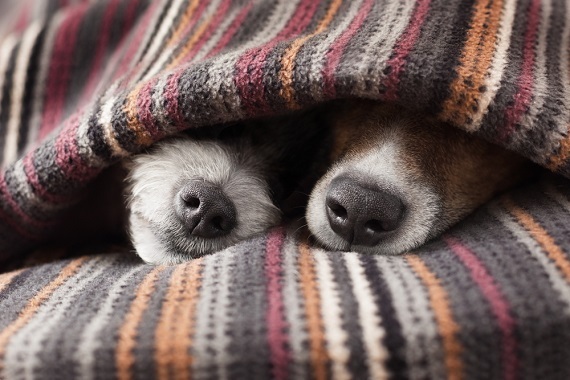 If you follow these simple rules, your pets will stay safe and happy during the cold months. Keep your pets in tip-top shape by staying up to date with vet visits. And look into pet insurance – an affordable pet insurance policy can be a real blessing in the event of an accident or emergency. Contact your local independent insurance agent today to ask about pet coverage. Workers’ Comp Insider has posted interesting advice for surviving the polar vortex & staying off the “stupid human tricks” list. 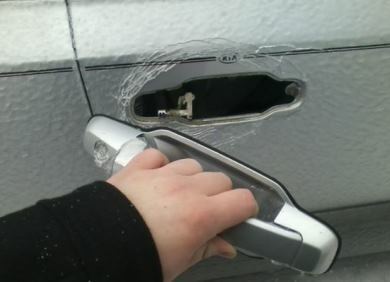 Learn from the mistakes of others – and do check out their handy list of tools for staying safe in in the frigid temps. Extreme weather is nothing to fool around with – it can throw the unwary into life-threatening situations in a matter of minutes: ‘Polar vortex’ blamed for at least 21 deaths. Plus, when the temperatures drop, there is always a spate of house fires related to the use of space heaters — some with tragic results. The Massachusetts Department of Fire Services has a great tip sheet on Space Heater Fire Safety. Brrr… are you prepared for the cold if your car gets stranded? New England is experiencing the kind of weather that is challenging to car batteries. Are you adequately prepared for emergencies when you’re on the road? In this weather, being stuck on a public highway for 20 or 30 minutes while waiting for emergency help to arrive can be a hardship. Being stranded on a remote road late at night can be a nightmare anytime and life threatening in frigid weather. Keeping your car maintained is rule number one but it’s also a good idea to keep a winter car survival kit in your car for the season because you just never know. Emergencies by their very nature take us by surprise. The state of Wisconsin, which has it’s share of cold weather and remote roads, offers a good one page sheet on How to make a winter survival car kit – it’s one of the best we’ve seen. They also offer a video version – below. Ice Dams, Burst Pipes, Broken Tree Limbs: Saving Your House From Winter – good article in The Hartford Courant. Dealing with Ice Dams and other winter hazards – our blog post from last year. Winter Fires – safety tips for the home – PDF from FEMA and the US Fire Administration. Precautions for Extreme Cold Weather – from the Massachusetts Emergency Management Agency. Winter Hazard Awareness – the Minnesota Department of Public Safety offers tips for safety outdoors, indoors, and in your car. Extreme Cold: A Prevention Guide to Promote Your Personal Health and Safety – from the Centers for Disease Control and Prevention, including winter checklists and info on indoor and outdoor safety. Working in the Cold – from the Canadian Center for Occupational Health & Wellness. Winter driving tips from Car Talk . Safe Driving and Good Car Maintenance Take Center Stage In Winter – from the Insurance Information Institute. Icy Road Safety – tips, news, statistics, and links to current road conditions by state. Driving Tips on Snowy & Icy Roads from How Stuff Works.